I do still think all this. However.... the price of bread is just STUPID now. 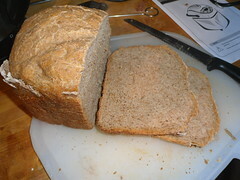 And while I LOVE to make my own bread *properly* what I lack is the time and the space. With 2 kiddies - regardless of hubby being home or at work (yay, he's got a job again!) - I don't really have the time to mix and kneed the bread, or have anywhere I can proof it. Once upon a time I used to rest it on top of the radiator in the living room, but that meant only having home baked bread in the dead of winter. And think about it, 2 kids and a cat with bread dough sat right there in poking reach... it's not going to happen.